This weekends project was to build a small brick coal merchants office for Smestow. Close up pictures can be very cruel. 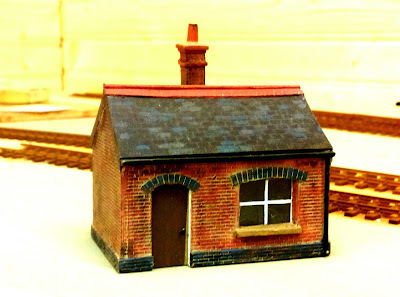 This is the coal merchants office built for my new layout "Smestow" Scratch built from Plasticard and some Wills brick arches over the door and window. Not only dose the picture show all the imperfections but it also shows up the difference between the Slaters Plasticard used for the walls and the Wills bricks used for the arches. Bear in mind that the picture is at least 10 x the size of the real thing and at a normal viewing distance of 2 feet away looks reasonably OK. The next job will be to add signage and plonk on the layout. I've now got to do a copy of this office for the Cradley Heath MRC's layout "Halfpenny Green"